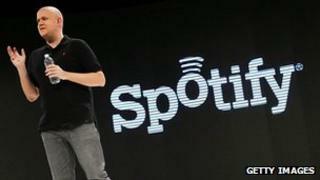 Music streaming service Spotify has launched in Mexico - its first push into the huge Latin American market. The Swedish start-up, which has more than 24 million active users, has also gone live in Asia - in Hong Kong, Malaysia and Singapore. Launches in Estonia, Latvia, Lithuania and Iceland mean the service is now accessible in a total of 28 countries. Spotify is the leader in music streaming globally, but analysts expect Apple to make its move soon. It is believed, but not confirmed, that Apple has come to an agreement with several major labels, including Universal Music, to launch a streaming service which has been informally dubbed "iRadio". A music industry source told the BBC he expected Apple's product to be available by the third quarter of this year. However, Spotify's head start in the market has seen it amass more than six million paid subscribers since its launch in 2008. Income from these customers, coupled with advertising and large private investments, has gone towards paying more than $500m (£327m) to rights holders so far. The company expects to pay out another $500m in 2013, it added. Key to this expansion will be further inroads in markets adopting digital music in greater numbers. According to the International Federation of the Phonographic Industry (IFPI), Mexico is the 16th largest digital music market in the world. Since 2008, its digital music market has grown by 17%. But it is in Brazil where real riches lie. In 2011, Apple launched its iTunes music store in the country - with high sales volumes surprising critics who assumed the region was too entrenched in a culture of pirating music. In IFPI's most recent report on the area, a Universal Music spokesman said: "We are seeing a significant rise in sales of smartphones and growing internet access in Brazil. "Once consumers have the hardware, they need the media." Digital music: Can streaming save music sales?